Articulating and sharing teaching practices for building student understanding of globalization and social justice is the focus of a new book edited by two University of Wyoming College of Education faculty members. The first book had a more foundational goal, according to Kambutu. The impetus for the first book emerged from questions that arose during the editing process of a special issue of Multicultural Perspectives, which focused on globalization. “It seemed that what people were talking about was somewhat consistent with the work that Lydiah and I did in Kenya,” Kambutu says, referring to summertime service learning projects they have led in that country since 2004. “Social Justice Education, Globalization, and Teacher Education” extends the theoretical foundation laid in the previous two works into practical examples of how teacher educators are incorporating global and social justice issues into their curricula. To that end, the book describes a variety of instructional approaches relative to integrating social justice and global education in teacher education courses. It also addresses how teacher educators conceptualize global education and social Justice. Nganga and Kambutu also note that this book promotes skills in collaboration, critical thinking, problem solving, ethical practice and lifelong learning. “What we received was a lot of really, really good work that helped us to understand what is happening in teacher education programs, in regard to how teacher educators are supporting pre-service teacher candidates in exploring globalization in the global and local contexts,” Nganga says. As with the multicultural perspectives issue and the first book, all chapters in “Social Justice Education, Globalization, and Teacher Education” were peer reviewed and accepted based on academically rigorous standards. Nganga devoted the bulk of her fall 2014 sabbatical to coordinating the publication process. 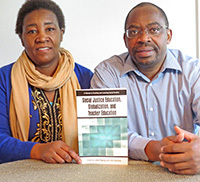 “Social Justice Education, Globalization, and Teacher Education” includes chapters by Kambutu and Nganga as well as UW College of Education faculty members Amy Roberts and Peter Moran. Moran’s students selected their own data sets and created their maps. Using the statistical information for scaling (rather than using land area for the scale, as is typical in other maps), the students used graph paper to produce their cartograms. The result is a map that often has profound distortions because of the statistical differences between places. “The purpose of the project is for students to research a global issue that interests them (military spending, oil reserves, hunger, etc.) and locate a data set that is related to the topic,” Moran says. “That data set is used to produce the cartogram. Students also had to interpret and analyze their data and cartogram so that they could explain the causes and effects of the global issue they chose. Her personal and professional experiences as a Fulbright scholar in Taipei, Taiwan, and, most recently, U.S. State Department fellow in Mandalay, Myanmar, enriched her commitment to internationalizing teacher education for social justice. Nganga and Kambutu say they see this work as an integral project in the critical discussion of preparing 21st century learning. It is a conversation that demands citizens address and understand local and global issues as well as work collaboratively with individuals representing diverse cultures.